Their company philosophy is to get the industry involved and Ping are certainly taking a lead role in making it happen. 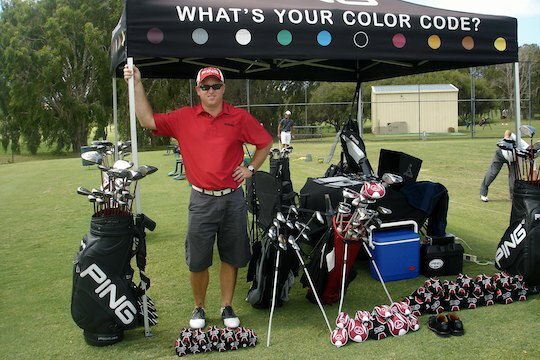 After 17 successful years in Asia, Ping education and training specialist Colin Field has returned to Australia to take up a similar role in Queensland with Ping Australia (American Golf Supplies). Field and Ping are on a mission to not only showcase what the leading golf brand have to offer Down Under, but to play a critical role in the development of the game from grass roots up. Field joked turning 40 was reason in itself for his return, but there is more to it than that. “The move will involve a lot of travel in one of golf’s fastest growing and dynamic markets coupled with a great offer to develop the Queensland market for Ping,” Field said during the company’s recent fitting day on the Gold Coast. A key to Field’s role will be overseeing an increased number of fitting days in the Sunshine State – a step he sees as a vital cog in the development of the game up north. “Certainly, our emphasis for Queensland is through fitting days,” Field said. “By analysing a golfer’s swing through technology, training and assessment is far better result for our customers. “We will come to golfers through fitting days like the ones held at Palm Meadow Driving Range on the Gold Coast recently.